Get off to a fresh start in the morning with a bowl of homemade skim milk yogurt shooting for greatness in weight loss. Like other yogurt diets on the plain yogurt and skim milk diet you can get all the benefits of eating yogurt with the convenience that you only get from a food diet. Combine the benefits of skim milk and yogurt for a recipe for less stress when trying to lose weight. What to do with plain yogurt? Just by replacing breakfast with Yogurt and Skim Milk can you boost your metabolism while blocking the absorption of fat. That's the plain yogurt and skim milk diet. No strings attached. Go about eating lunch and dinner as usual eliminated stress in your diet. Not only is it easy to continue over time and great in combination of other food diet plans such at the hot yogurt diet, it is said to be great if you suffer from constipation and are looking to slim down the beauty way. In this daily take on Slism, we introduce the plain yogurt and skim milk diet including a simple recipe for skim milk yogurt to accompany your diet not forgetting about benefits from yogurt and how keep from plateauing in your diet. Start the plain yogurt and skim milk diet by mixing together your favorite plain yogurt with some healthy skim milk for breakfast in the morning. Turning skim milk and yogurt into a snack is also one way to go about it. There's no limit to how for you can go dieting with yogurt and skim milk. Here is a hassle free recipe to make skim milk yogurt just by using plain yogurt and skim milk that can be made before hand making a great time saver for dieting on the go. 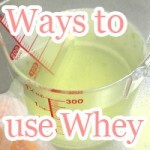 Mix plain yogurt (200g) and skim milk (30g) together until reaching even consistency. Then, using a paper towel or napkin cover the milking bowl fastening it closed with a rubber band or similar material. At a temperature between 68 and 86 degrees Fahrenheit for 12 hours letting it sit. Note that not letting it sit for long enough results in a watery consistency closer to that of skim milk. Letting plain yogurt and skim milk sit longer while preparing increase lactic acid bacteria growth that you want to happen. More recipes using yogurt including recipes for Greek yogurt, frozen yogurt, a yogurt smoothie, salted yogurt, and relaxing hot yogurt. There is no rule about how you should going about eating after breakfast. That means you can eat the foods you want without having to carry your diet around wherever you go. Just keep in mind that for best results never go past 80 percent of what you can really eat. Eating skim milk yogurt is said to help block fat from being absorbed by your body. This combined with getting more calcium in your body is the hit two birds with one stone approach to dieting. By having a bowl of plain yogurt and skim milk in the morning, you step closer towards balanced nutrition while reducing your daily calorie intake. In 230g (approx. 1 cup) there are 232 calories in plain yogurt and skim milk with 17.4g of protein (69.6Cal), 6.3g of fat (56.7Cal), and 25.79g of carbohydrates (103.16Cal). Plain yogurt and skim milk is high in potassium, calcium, and vitamin B2. The calories in 230g of plain yogurt and skim milk can be burned off in 29 minutes of climbing steps or half an hour of swimming. In order to lock down success in your diet, it becomes ever important that you get enough protein in your diet. Protein is a macronutrient that is easy to forget, especially when on a diet. Not getting enough protein in your diet causes your body to metabolism existing muscles around your body resulting in noticeable loss in muscle mass making you weaker. Eating plain yogurt and skim milk for breakfast gives you protein to maintain muscle while reducing fat absorption by your body. Studies suggest that people taking in more calcium in their diet have less body fat around their body. Further investigation revealed that calcium acts as a fat blocking agent in your blood inhibiting fat absorption in your diet. Calcium on top of helping you build strong bones has a relaxing effect on your body that serves to keep you emotions at rest ideal for dieting. Yogurt is an excellent source of "good" bacteria such as lactic acid bacilli that when mixed with skim milk and let sit, the amount of this good bacteria increases. Lactic acid bacteria in your body have a probiotic effect in your body helping to eliminate constipation while improving gut flora health. With stronger gut flora, you can naturally detox your body while lowering the chance of developing dry skin and acne. Although skim milk yogurt gives you protein and calcium in your diet, a diet solely based on eating plain yogurt and skim milk lacks in nutrition you need to lose weight. Make sure to eat balanced meals during lunch and dinner and you have nothing to worry about. Always keep balance in mind when dieting. Eating yogurt plain may not be the sourness you signed up for but that doesn't mean you can just empty the sugar bowl trying to solve the problem. There's sugar in skim milk. So instead of adding sugar pouring just a little bit more skim milk may be the trick. Just try not to go overboard. If your yogurt is still too sour to eat, adding fruit such as blueberries, bananas, or a peach is recommended. 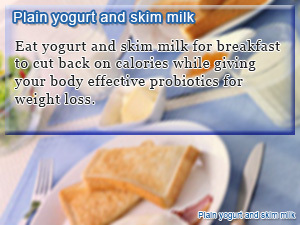 Eat yogurt and skim milk for breakfast to cut back on calories while giving your body effective probiotics for weight loss. Add skim milk to plain yogurt and let it sit. 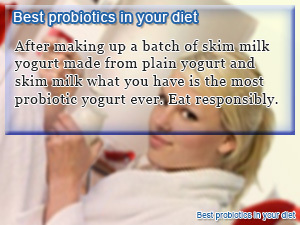 What you have in the end is skim milk yogurt packed with probiotic good bacteria. After making up a batch of skim milk yogurt made from plain yogurt and skim milk what you have is the most probiotic yogurt ever. Eat responsibly.